As we surge ahead and find ourselves in the second half of the year (what, already!?! ), I was curious to know what the top fitness trends in 2016 were. It comes as no surprise that wearable technology for fitness is right at the top with an estimated market size approaching 6 billion USD this year. The market is changing dramatically with innovations disrupting established markets and opening up new ones. I was pleasantly surprised to see my favorite fitness exercises – HIIT and YOGA ranking in the top 10 list. 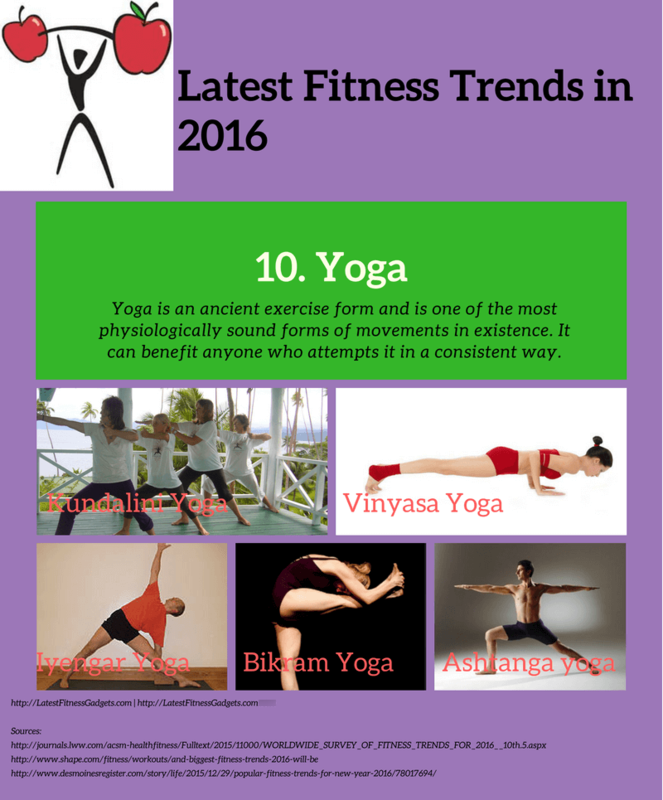 The Infographic below lists the top 10 fitness trends in 2016. Has your favourite made the list? Check it out. ← HIIT For Fitness: Fact or Fiction? Sandeep, I love the infographics. It suits my learning style. Great job. My favorite came in at number 9, “Healthy Diet.” I will be trying out HIIT later today. Thanks for taking the time. Love it! In today’s fast food environment it’s a challenge to have a healthy diet consistently. I personally struggle with it. Great to hear that a healthy diet is a priority for you. When you add a HIIT program to your schedule, I can promise you will not be disappointed as long you stay committed to your fitness plan. Glad you liked the infographic and found it useful. Hiya I,m also surprised wearable technology comes up first, I would,ve thought exercise and weight loss would come out top, but in the world, we’re living in on obesity, you expect that? So that’s my thoughts, seeing there is an obesity epidemic in the world, exercise and weight loss has to come first. I hope you agree! I can understand why you feel that Exercise and Weight loss should be at the top. Let’s take a moment and think this through…the interesting thing about Wearable Technology is that potentially everyone in the other nine trending groups and beyond can benefit from a fitness gadget. Let’s say, John’s into exercise and weight loss and Mary is into Yoga for the health benefits. Both are potential customers for the wearable technology gadgets. This logic can be applied across all the groups making Wearable Technology the undisputed winner! Companies base their sales forecasts, budgets, and marketing strategies based on these trends. The fitness trends for 2016 are what it is and we know that trends in exercise change over time. What makes it to top 10 this year may not make the list next year but fitness trends are here to stay and there will always be a top 10 list. I love all of this, I found walking and eating healthy works best for me, although I would love to have a treadmill for winter time. We have some brutal winters in Pa, so a treadmill would be great. When done right and consistently, eating healthy and walking is the perfect recipe for long-term health and fitness. I am glad you have found what works for you. If you wanted to take it to the next level, you could consider including a HIIT routine to your walk. And this can be extended to the winter months if you have a treadmill at home. A treadmill is a great investment, one I would recommend. It will increase your commitment to keeping fit and you can continue on your fitness plan even when the weather is not great outside. Glad that you liked the blog. First I wanted to comment on how great the infographic looks – an easy read. I was very interested to read about the top trends, particularly HIIT and yoga. I must admit I’m too lazy to work out, but yoga is something I’ve always loved doing, and now when I cycle I try and think HIIT – I challenge myself for a couple of minutes, then slow it down, speed up for a bit…. I figure once I’m finally on it I might as well get maximum benefit. That sounds really great. Doing HIIT with cycling and Yoga will stand you in good stead with your fitness goals. If you plan and follow through consistently, you don’t have to worry about working out. Your body is getting the exercise it needs to be fit and healthy long term. I see how you have wearable technology as number 1 and I completely agree as that is something that gets my attention a lot. In your opinion which is the best sports watch to invest in? My personal favourite is the Casio G-Shock DW5600E-1V Men’s Watch. Reasonably priced, it’s a no-frills sports watch that looks cool, is simple, reliable, tough and delivers what it says on the tin. very nice infrographic! I totally agree with every point (youtube is more than a proof). I enjoy most running, interval training, and body weight training myself. Which one is your favorite? My personal favourites are HIIT and Yoga. For HIIT, I prefer to walk, run or swim. My favourite yoga class is Iyengar Yoga where one holds the pose for a longer duration for correct alignment and posture. Running, interval training and body weight training are excellent for your fitness training. As long as you are consistent and have a plan, you are sure to achieve your fitness goals. Good stuff, great information. I’ve been moving more towards the bodyweight aspect of physical training lately, getting bored with weightlifting. Out of those 10, which do you personally think is the best? Also, I see benefits of both weight training and body weight but when it comes to a leaner physique and actual conditioning I think bodyweight takes the cake. What are your thoughts? My personal favourites are HIIT programs and Yoga. I have been doing these for a while and find them very effective. I mix my HIIT training with walking, running or swimming depending on how I feel. This keeps away the boredom that often comes with doing the same things over and over. It’s great that you are into body weight training which is the no.2 fitness trend this year. When you combine this with a planned diet, a leaner ripped physique is the result. I would also recommend including a HIIT plan for cardiovascular health and faster fitness results. I like this article very much especially because it is so visual and illustrative in the form of infographics. It helped me to see easily which moves I would like to pursue further. You are so right about the popularity of wearable technology. This is one thing I must get for myself because it is fashionable as well as being functional. Being a bodybuilder and personal trainer, I agree with this 100%. Wearable technology is by far the top thing. I own a Fitbit and so does my wife. Probably 80% of people I know that are avid in fitness or just do stuff periodically own wearable technology. It just make everything convenient and can give you a quick snapshot with decent accuracy. I have to say I am not surprised by this list because I see all of this in the gym and on social media. This is a great post and can help those in this niche capitalize on the opportunities available. Thanks for sharing. Thanks Bryatt. Fitness awareness is on the rise across the world, and wearable technology help in motivating and tracking progress. It wouldn’t surprise me if the trend continues in 2017. Great post! I find it interesting that strength training using one’s own weight is increasing. What are the advantages to that compared to normal weight lifting? I always had trouble seeing gains from just pushups, but maybe I was doing them wrong. I didn’t realize exercise in older adults was such a trend now as well! Both have their pros and cons and it has a lot to do with ones fitness goals, personal preference and circumstances. My work takes me all over the UK and this coupled with long work hours make it difficult for me to commit to a gym. I prefer strength training and yoga which I can do anyplace anytime. Should my circumstances change, I would opt for weight training in a local gym. I really like how you incorporated pictures into this post! It makes it simple to understand and straight to the point. I had no idea that body weight training would’ve been number two on the list. Thanks for sharing! Thanks James.Body weight training’s ranking surprised me as well, although it is good to see this trend. Nice info graphic! This is great as I recently tore my acl so I will be using many of the body weight training exercises as well as the functional fitness activities. I’m currently just doing physical therapy to get ready for the surgery but then will be full force after the surgery! Thanks Jeremy and hope you are well on your way to recovery. Knee related injuries are often slow to heal. I suggest hiring a personal trainer when you are ready to hit the gym. That way you mitigate the risk of injury during exercise. It is really astounding how much we have progressed in the area of fitness, your info-graphic makes me to realize that, I am especially curious about the gadgets you have put under the point1, would love to buy them, but I will have to learn to make proper use of it first. Wearable technology provide live tracking data on physical activity and health that helps you stay on track and motivated to achieve to your fitness goals. Although the features vary by brand, all fitness gadgets are fairly intuitive to use. Hey! Love this article, really fun to see that my 2 absolute favourites are rated so up high. 2. Body weight training and 3. High intensity interval training. As I have tested it out many forms is running (doing different type of intervals + mixing the workout up with a body weight training) I know what works best for me and the coolest part of it is that you never get bored because you constantly are able to change the tensity and the length of the interval + the body weight training exercises so that keeps the motivation to exercise up. Thanks Reelika and I couldn’t agree more. Motivation is key to success and anything that helps in keeping it high is well worth the investment. Knowing what works and what doesn’t for oneself is a indeed a factor that impacts motivation. Well done.